Good morning and welcome to another episode of #ThatBusinessShow with your Host, Jamie Meloni! Here on #ThatBusinessShow on #1250whnz, we wake up bright and early every weekday at 8am to interview people who make a difference in our community, and who have been successful, or even just do something interesting! If you’re interested on being a part of this show, head over to http://www.tampabayradio.com to drop us a line! Today we had two wonderful guests, Enrique Woodroffe and Kristin Pelletier. Enrique Woodroffe is the President of Woodroffe Corporation Architects, a company with a passion to help our community. 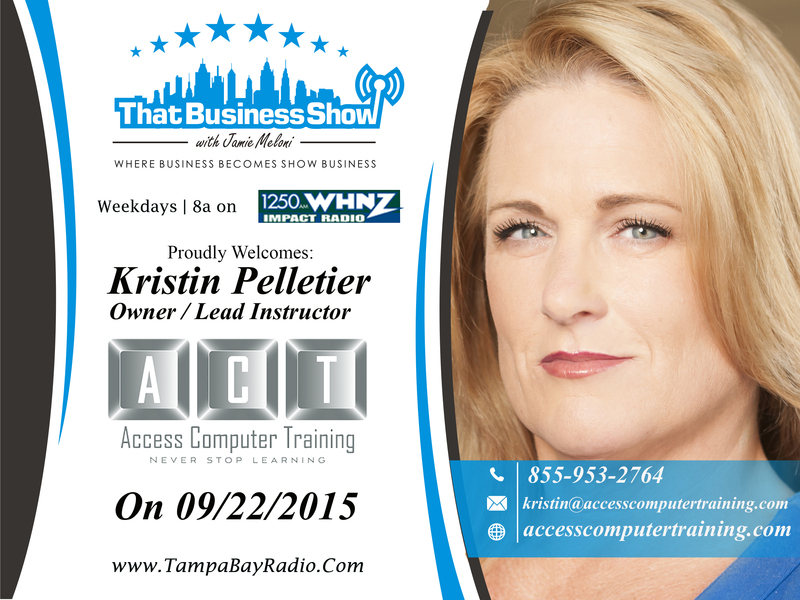 Next on #ThatBusinessShow, we had Kristin Pelletier; The Owner and Lead Instructor of Access Computer Training. We had a great discussion here on the show with our Host, Jamie Meloni. If you missed today’s episode, you can catch the entire show on http://www.tampabayradio.com or head to my YouTube channel at http://www.youtube.com/jamiemeloni. 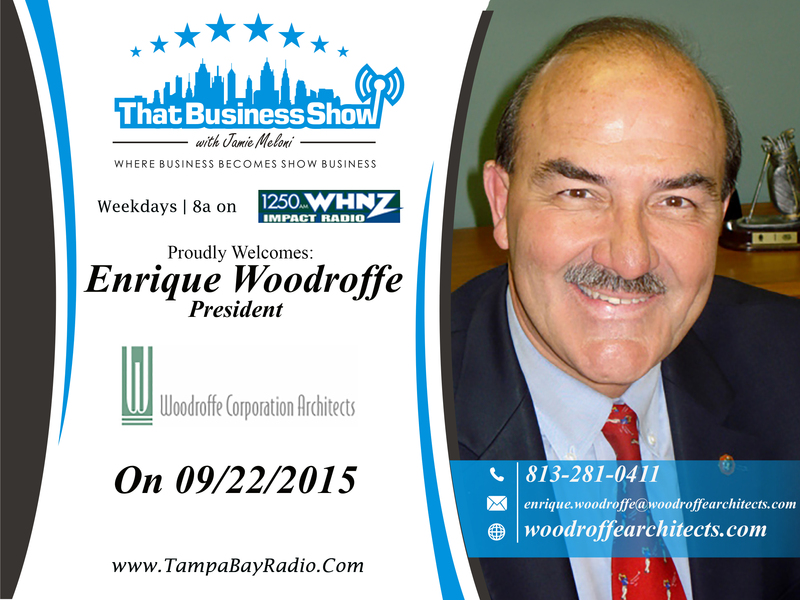 Going up first on today’s episode of #ThatBusinessShow we had Enrique Woodroffe, the President of Woodroffe Corporation Architects – a company with a passion to help our community. Enrique (Henry) Woodroffe is a native of Lima, Peru who moved to Wilmington, Delaware in 1961. He discussed with Jamie a little about his history of growing up in Peru and traveling to the United States eventually to become an entrepreneur from a long line of architects. Jamie and Enrique also discussed the recent growth in Tampa Bay, and how that growth has been sustained, and that even more growth is to come! As part and leader of several boards, Enrique is heavily engaged in the community, and he has always been active in community service. Henry is involved in his church, and for over 15 years has annually performed volunteer work during the summer in the Dominican Republic building schools, clinics and churches. You can find out more about Enrique Woodroffe and Woodroffe Corporation Architects at http://www.woodroffearchitects.com. Our last guest here on #ThatBusinessShow today was Kristin Pelletier; The Owner and Lead Instructor of Access Computer Training. Access Computer Training prides itself on providing people with the necessary skills they need to use advanced programs like Adobe Photoshop and Microsoft Word. She is the leading instructor at Access Computer Training, and just received the SmartStart Member of the Year Award. Kristin discussed with us the community events she offers to seniors, helping them to better understand technology like cell phones and the internet. You can learn more about Kristin Pelletier, Owner and Lead Instructor of Access Computer Training at www.accesscomputertraining.com. As always, thank you for tuning into #ThatBusinessShow with Jamie Meloni on #1250whnz, weekdays at 8am. If you missed today’s show, you can always visit my website and see all of our shows on demand at http://www.tampabayradio.com or visit my YouTube channel.